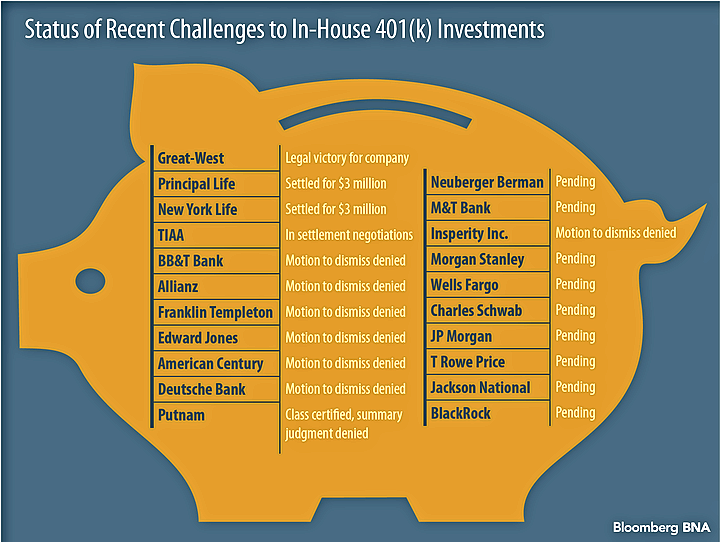 BlackRock Inc. and its subsidiaries are accused in a new lawsuit of loading the company’s $1.56 billion 401(k) plan with its “expensive and poor-to-mediocre” in-house investment options ( Baird v. BlackRock Institutional Trust Co. , N.D. Cal., No. 3:17-cv-01892, complaint filed 4/5/17 ). The proposed class action, filed April 5 in a federal district court in California by BlackRock former employee Charles Baird, alleges that participants in the 401(k) plan were subjected to higher hidden fees through excessive fund layering, where one BlackRock fund invested in a “rabbit hole” of other BlackRock funds. This fund layering “cannibalized” the employees’ investment returns through fees charged by the management of each fund, the lawsuit alleges. Baird alleges that the fees plus the poorly performing funds have caused participants to lose $60 million in retirement savings. The plan has more than 9,700 participants. Baird claims that in total, 21 of BlackRock’s in-house funds in the 401(k) plan funneled retirement assets into other BlackRock funds, which charged additional fees. He further alleges that, in some cases, a single BlackRock fund is funneled into as many as an additional 27 BlackRock proprietary funds, which resulted in at least 26 additional layers of fees. The suit is without merit and we intend to defend vigorously against it, Tara McDonnell, a BlackRock’s spokeswoman told Bloomberg BNA via e-mail April 6. “BlackRock is committed to making the best decisions in the interest of our plan participants, continually looking for ways to deliver services with low cost and high quality,” she said. BlackRock is the world’s largest asset manager, with $5.1 trillion in assets under management. The lawsuit is the first Employee Retirement Income Security Act class against BlackRock, according to Bloomberg Law Litigation Analytics. Similar lawsuits have been filed against 20 other financial companies, including T.Rowe Price Group Inc., Jackson National Life Insurance Co., JPMorgan Chase Bank, Charles Schwab Corp. and Wells Fargo & Co. So far judges have sided with the employees by refusing to dismiss cases against BB&T Corp., Allianz, Deutsche Bank and others. Baird alleges that at least 92.9 percent, or $1.4 billion, of the plan’s assets were invested in entities affiliated with BlackRock. These funds in the plan performed worse than their respective benchmarks and other comparable nonproprietary funds with similar investment strategies, Baird alleges. The lawsuit points to BlackRock’s 2009 acquisition of Barclays PLC’s fund management arm—Barclays Global Investors, which later became BlackRock Institutional Trust Co. N.A. After the acquisition, plan fiduciaries allegedly showed a clear trend of preferring affiliate investment options, including trusts sponsored by the newly created BlackRock Institutional, Baird alleges. By selecting BlackRock’s in-house funds, the fiduciaries ensured that BlackRock would receive substantial fees paid with plan assets and would increase the affiliates’ assets under management, the lawsuit alleges. The lawsuit includes a table that illustrates the layering of BlackRock funds. The fees paid by plan participants through the “rabbit hole of fund layering” weren’t reflected in the expense ratio reported to participants, the lawsuit alleges. Alleged excessive fees in BlackRock’s funds have come under fire in other lawsuits against JPMorgan and Starwood Hotels & Resorts Worldwide Inc. However, BlackRock wasn’t named a defendant in those lawsuits. Cohen Milstein Sellers & Toll PLLC and Feinberg Jackson Worthman & Wasow LLP represent Baird. Text of the lawsuit is at http://www.bloomberglaw.com/public/document/Baird_v_BlackRock_Institutional_Trust_Company_NA_et_al_Docket_No.